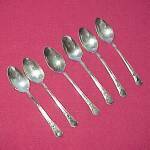 Set of Six 1940 Wm Rogers Avalon Silverplate Teaspoons Vintage 1940 very nice 6 inch spoons with pretty floral pattern called Avalon. Super light scratches, just tarnished, probably only need rubbed with a polishing cloth. Great dinnerware flatware replacements for your table setting. Price is for all six. 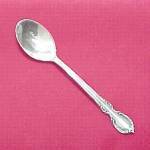 Oneida WR Keystone Carnation Sauce Ladle Silverware Pretty 1908 Silver Plate Flatware pattern to use with Carnation decorated dinnerware. W Adams Wedding Cake Knife Silver Plate Silverplate Ornate, raised Sea Shell Seashell pattern, Elegant special occasion dinnerware accessary. Stainless Steel serrated Blade, Made in Sheffield England. Should cut bread nicely too. Measures 12 1/4 inches long, 8 inch blade. A few minor usage scratches on blade. Handle is very nice, will shine beautifully with a silver polishing cloths. 53 Oneida Community White Orchid Slotted Serving Spoon Mid 20th Century 1953 floral pattern to accent your dinnerware. Elegant Slots for serving without liquid. Opposite side of handle shows the back side of the orchid. Measures 8 3/8 inches long. We have two. One shows only very light scratches. The other shows more usage. Both are quite nice, only nice shined with a silver polishing cloth. Price is for one. Best goes first. 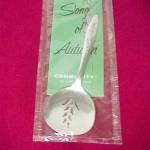 Oneida Silver Plated Song of Autumn Sugar Sifter New Vintage 1960 Community Plate pattern with cut-outs in flat bowl of spoon. 1898 Wm Rogers Seville Cold Meat Fork Silverplate Elegant Raised Dotted Handle. Silver Plated. This flatware pattern is interchangeable with many others. Measures 6 1/2 inches long. Very nice condition. Minuscule signs of use. Just needs polished with a silver cloth. 1847 Rogers Reflection Demitasse Spoon Washington Iowa IA Silver Plated Souvenir, tiny 4 1/4 inch Demi spoon made by International Silver. Rockford Oneida Hawthorne 1908 Meat Fork Silver Plate Rockford Oneida Hawthorne 1908 Meat Fork Silver Plate. Wm Rogers Silver Plate Melrose Meat Fork Silverplate Wm Rogers Silver Plate Melrose Meat Fork Silverplate. Oneida Silverplate Silver Plate Floral Pie Cake Server Oneida Silverplate Silver Plate Floral Pie Cake Server. Wm A Rogers Oneida Always aka Wildwood Serving Fork Pretty Silverplate Serving Fork with Slashes and Floral Blossoms. Marked on Back: WM. A Rogers, Oneida LTD, Made in 1958. Gently Used. Fork shows gentle usage scratches. No dings, dents or bends. New Silverplate Salt Spoon Open Dip Cellar Silver Plate Silverplate Salt Spoon Open Dip Cellar Silver Plate New.